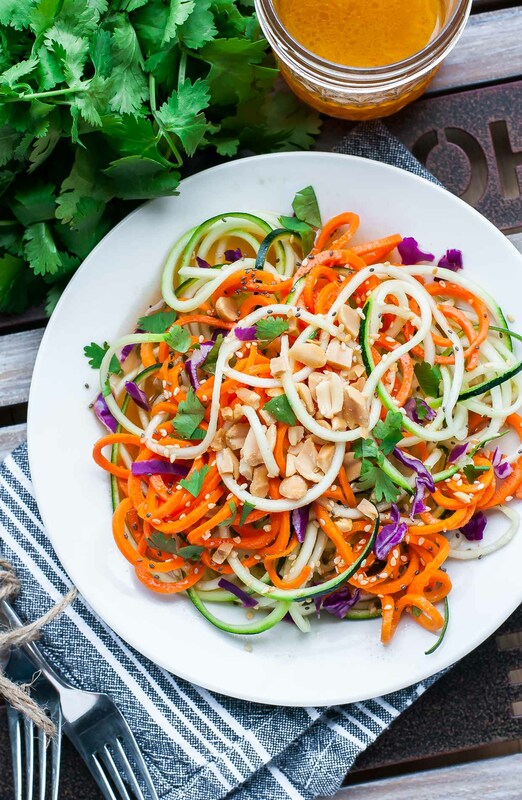 This Spiralized Thai Zucchini Noodle Salad with Sriracha Dressing is crazy tasty! Vegetarian and gloriously gluten-free, this healthy salad features a medley of colorful veggies topped with crunchy peanuts, fresh cilantro, and a zesty homemade dressing. I started this blog with an intense desire to chronicle my adventures in the kitchen and share delicious ways to shovel #ALLTHEVEGGIES into your faces and LOVE IT. I think I’m doing my job, right? Maybe? Please for the love of all things green tell me you ate a vegetable today! While the veggie love sometimes takes the form of total cheesy indulgence or a love letter to carbs, at the core of this little blog of mine are some seriously scrumptious salads. Of course not everyone wants to munch on rabbit food all day. Especially the 4 year old tyrant that harasses me for food all day long (holy growth spurt batman!) so I totally get that. I also totally get that if you turn your salad into noodles they’re suddenly 110% more fun. Oodles of veggie noodles FTW! 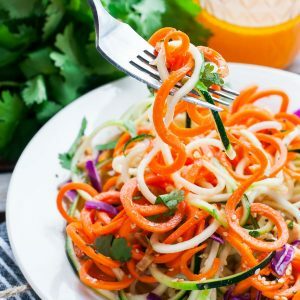 Inspired by my Sweet and Sour Thai Carrot and Cucumber Noodle Salad (which you also totally need to try BTW), this sassy spiralized salad is ready to shake up your eats. Make your dressing by combining fresh citrus juice with vinegar, oil, honey, garlic, Sriracha, and salt in a mason jar. Screw lid on tight and shake well. Set aside. Feel free to adjust the amount of sweetness to taste, as it cuts the spice of the chili sauce. Peel your carrots. 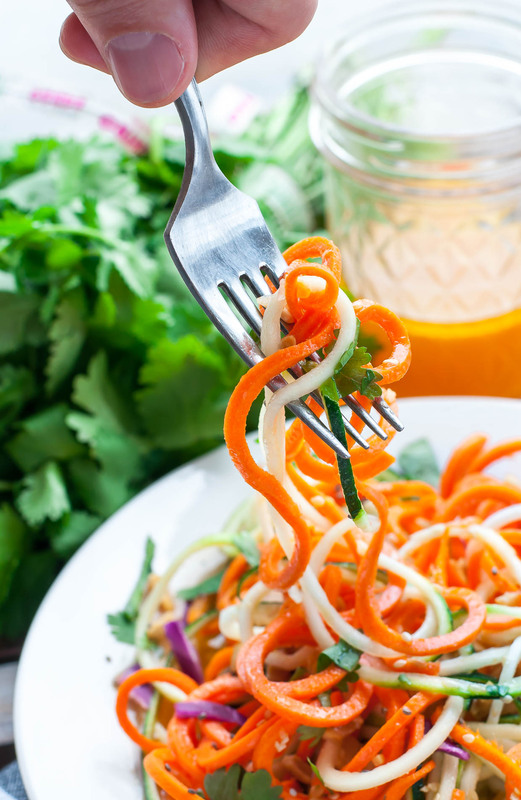 Chop the ends from your carrots and zucchini so they're blunt (this helps the spiralizer attach to the veggies easily) and spiralize into thin veggie noodles. For this recipe the bigger the carrots the better! If you can only find smaller ones, feel free to peel your carrots into thin ribbons using a veggie peeler. Grab your dressing and shake well. In a large bowl combine veggie noodles with cilantro (add a little, or a lot!) and cabbage and toss with half of the dressing. Divide salad into desired number of servings and top each with crushed peanuts, toasted sesame seeds, and chia seeds. Add any additional dressing to taste. If allowed to sit a little, the dressing soaks into the crunchy veggies a bit more and softens the salad just a tad. I kind of love it this way! I've been using the same Paderno 4-Blad Spiralizer for 5 or 6 years now and adore it. If you're looking to add one to your collection I cant gush enough about this awesome tool. Even my four year old loves using it! Delicious! I’m super in love with the salad-dressing combo here. 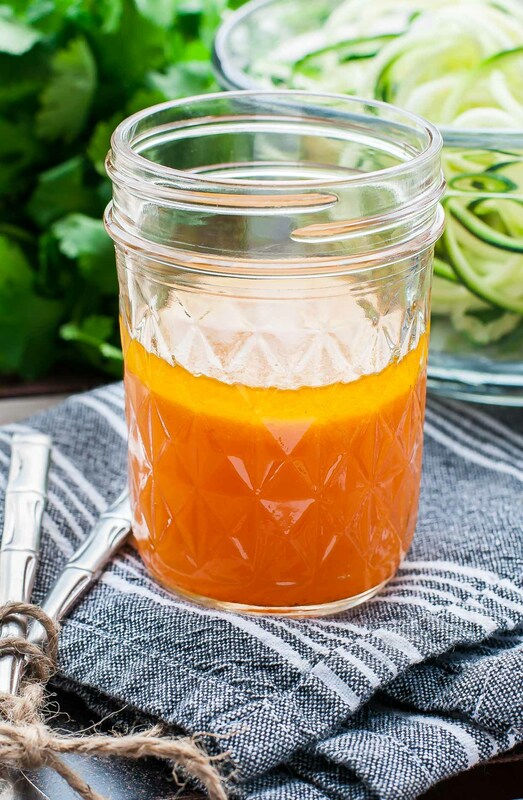 The sweet sriracha vinaigrette tastes amazing with carrots and zucchini, and the tasty toppings round out the dish with extra crunch and flavor. I’m terrible at explaining it actually but I love it so! Since the vinaigrette channels a medley of sweet, sour, and spicy flavors, it will easily compliment grilled chicken dishes, tofu, seafood, etc… so feel free to top your salad with a little protein or serve it up on the side if you’d like! You could even go super duper Sriracha crazy and serve it alongside my Sriracha Seared Scallops. 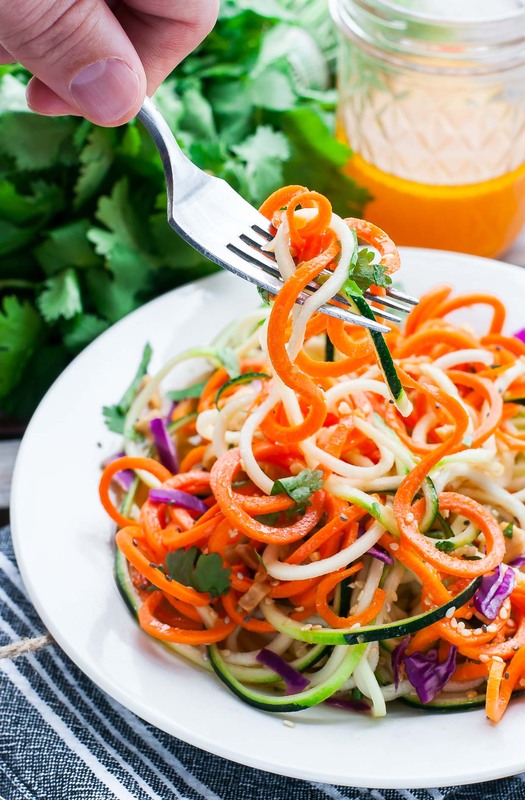 Spiralizers, Siraracha, and Salads… OH MY! What a great easy salad idea! Sounds so tasty and healthy!